In the last few quarters, most of the incremental credit to MSMEs were coming from NBFCs. With the IL&FS fiasco making liquidity tighter, there is a resource crunch in NBFCs which is being passed on to the MSMEs. Demonetization was also a major setback for the sector. The Micro, Small, and Medium Enterprises (MSME) are considered the backbone of the Indian economy and rightly so. As per the Ministry of MSME’s Annual Report for FY18, there were a total of 6.33cr MSMEs in India, employing about 11cr people, representing more than half of India’s workforce. Further, MSMEs accounted for 30% of India’s GDP, 45% of India’s total manufacturing, and 40% of India’s exports in FY18. However, these enterprises have been long ridden with challenges that make it difficult for them to sustain. A key problem they face is the lack of easy credit access and in recent times, this problem has only aggravated. Let us understand why. · In the last few quarters, most of the incremental credit to MSMEs were coming from NBFCs. With the IL&FS fiasco making liquidity tighter, there is a resource crunch in NBFCs which is being passed on to the MSMEs. · Demonetization was a major setback for the sector. With most of their labor force being contract workers, payments were normally made in cash. Owing to the cash crunch post the note ban, MSMEs had to lay off workers as they could not manage adequate liquidity. · GST is definitely an inclusive indirect tax but it has put a big burden on the MSMEs. First, compliance costs have gone up sharply. Second, exporters saw their working capital getting stuck due to input credits not coming on time. · Finally, the RBI banned Letters of Undertaking (LOUs) after the Nirav Modi scam, where PNB was duped to the tune of $2bn. This has put a several export-oriented MSMEs in a sticky spot. The chart below captures the Gross Value Added (GVA) of the MSME segment in India. Although data for recent years is not available, the demonetization exercise in Nov 2016 has definitely dented the growth rate of the sector. 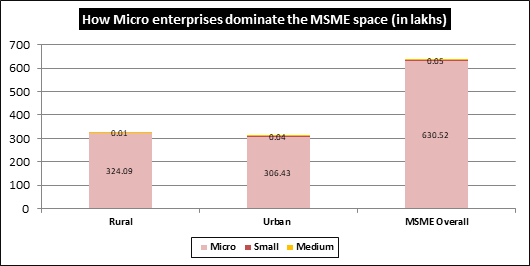 Micro enterprises comprise the lowest spectrum of the MSME sector in terms of investments. A micro enterprise is an enterprise where investment in plant and machinery does not exceed Rs25 lakh for manufacturing and Rs10 lakh for services. Small and medium enterprises (SME) are those wherein the investment in plant and machinery is up to Rs10cr for manufacturing and RS5cr for services. Let us look at the breakup of the MSME space into micro, small, and medium enterprises in terms of the number of units. The key problem with MSMEs in India is scale. In the case of urban MSMEs, nearly 99% of them are micro-enterprises while in case of rural MSMEs, almost 100% of them are micro enterprises. Hence, the MSME space is virtually a micro space formed by a plethora of mom-n-pop shops and hence, scaling them up is a problem, especially when fund access is challenging. The Confederation of Indian Industry (CII) has made some key demands to the government and to the RBI for easing the flow of credit to the MSME sector considering their strategic nature. Given below are some of the key demands that the CII has made. · Considering that the MSME credit actually fell by 1.4% in September 2018 on a yoy basis, the CII has recommended a ceiling limit of 15 days for the sanction of term loans and working capital facilities for MSMEs. This does not consider the disbursal time but will at least hasten the process. · Most banks demand collateral against loans sought as a safety measure. The CII has requested the RBI to mandatorily limit the collateral to a maximum of 133% of the loan facility so that the burden is not excessive on the MSME. · CII has also recommended that a “Points Reward System” be set up for MSMEs on the lines of no-claim bonus by insurance companies. MSMEs with a good payment track record to be eligible for a lower margin and lower rates of interest. · Reviving the letters of undertaking (LOU), which were banned by the RBI after the Nirav Modi fiasco, is another major demand of CII. The RBI, in its policy review meet earlier this week, announced that it would be setting up a committee of experts to look into easing credit hurdles for MSMEs. The RBI, earlier, had agreed on working out a loan restructuring scheme for SMEs for a loan exposure of up to Rs25cr in line with the advice of the RBI board to ensure the financial stability of MSMEs. In a nutshell, scale, credit, and market access have been major challenges for MSMEs. The proposals and recommendations made in favor of MSMEs are definitely growth-enablers, however, anything less than concrete, on-the-ground measures would not help much in revving up the main engine of India’s economy.